AUSTIN – The SXSW experience is, above all, noisy, both in a physical and also signal-to-noise sense. In the documentary film strand of the conference, it was barely possible to distinguish some trends. Below are some of the most noteworthy trends in innovation for documentary filmmakers at the recent conference in Austin. Streaming video services were ubiquitous. Hulu is aggressively competing with the biggest players, Amazon and Netflix, for new work. Filmmakers are looking for alternatives to the take-it-or-leave-it Netflix-style contract, and especially looking to hold on to some back-end rights. They would also like some data on performance, which may be even harder to get. "Even with all the new streaming money flowing into the environment, it’s not easier to make a living as a documentary filmmaker." Even with all the new streaming money flowing into the environment, it’s not easier to make a living as a documentary filmmaker. The conclusions of a 2016 Center for Media & Social Impact report are still valid today. As filmmakers Doug Blush, Tom Hardy, Alexandria Bombach, and Bradley Beesley testified, it’s still about renting your equipment out, taking odd jobs, working for hire and maybe teaching in order to fund your passion. But others are working on changing the ecosystem. Jax Deluca from the National Endowment for the Arts highlighted takeaways from an ongoing, field-wide strategic planning process. Along with film-specific opportunities (think state and local tax incentives) and building representative institutions (the International Documentary Association now has an advocacy staff person), panelists reminded filmmakers to pay attention to larger policy issues, such as net neutrality. Meanwhile, at Google’s diversity summit, Full Color Future, FCC Commissioner Mignon Clyburn pointedly criticized the FCC’s lack of concern for consumers, and asked creators as well as small businesses and activists to make their voices heard on net neutrality. Sophisticated visual design is becoming essential to documentary filmmaking, whether for transitions, infographics, animations that whisk through exposition, or emphasis. If you had any doubt about its central importance, look at Hao Wu’s “People’s Republic of Desire,” which describes the intense world of internet-famous celebrities’ streaming showrooms in China (on public TV next year). Another important one for visual design is “Take Your Pills,” a Netflix doc by Alison Klayman on the many faces of Adderall culture in a society addicted to speed, efficiency and individualism. One side effect: Filmmakers have never expected to need much quantitative savvy, but with the rise of data visualization, it’s becoming clearer how important that skillset has become. 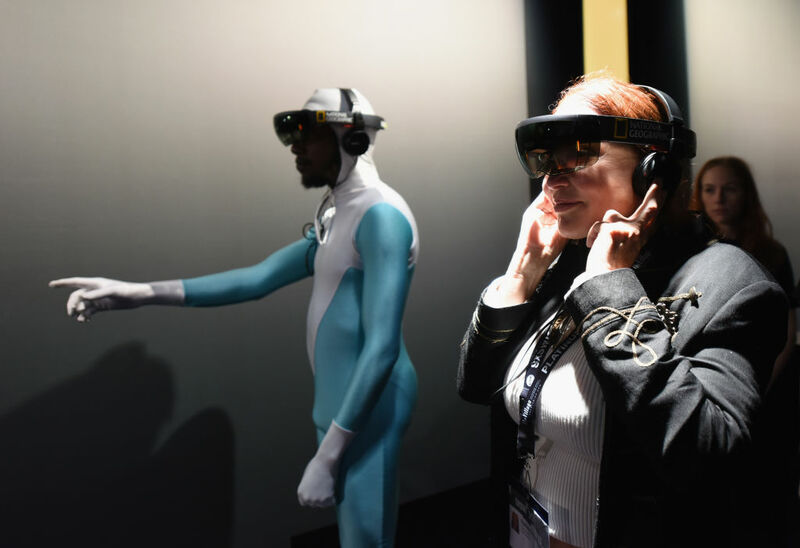 VR got its own large display room, with a few spectacular items, including a music video on steroids, “Beethoven’s 5th,” and a magnificent, alarming visit to Greenland’s rapidly melting glaciers, “Greenland Melting.” But many of the documentary VR exhibits were passive-viewing 360 video, VR’s low-hanging fruit. My fave of that kind was a short “VR for Good” project (funded by Oculus, which matches non-profits with filmmakers) from the U.K. on testicular cancer awareness, Ryan Hartsell’s “The Evolution of Testicles.” It deftly used the form to surprise you, make you laugh, and hammer home the message with humor. You get to go up high in an air balloon shaped like a giant pair of testicles. Very, um, ballsy. Generally, though, it was often hard to parse why the subject matter and narrative wouldn’t work as well if made as a 2D documentary. “Sun Ladies,” for instance, was an absorbing visit to a military unit of Yazidi women fighting ISIS, and could have been a recruiting video; but the VR wasn’t necessary to the telling. But no matter what, the limitations are still stark. The equipment is clumsy, access is minimal (perhaps 300 people at a festival), and smart-phone/Cardboard viewing lowers the quality. Makers of course are endlessly hopeful that technological wizardry is around the corner that will be more accessible. I think the oddest moment I had in the festival was while watching “More Human than Human,” by Tommy Pallotta and Femke Wolting. It’s about the way AI (artificial intelligence) is all around us and getting big enough to be downright creepy. (Or worse than that: at SXSW Elon Musk went out of his way to warn people to be very afraid.) In the doc, an engineer is demonstrating the speech capacities of the robot he programmed, “Sophie.” To do so, he hits on her…and she winks. Really. I’m still waiting for the robots’ #MeToo moment. Despite the challenges, SXSW showcased how the documentary form has become an important element of media ecology. Far beyond the “pivot to video” in journalism, documentary is a thriving line for streaming media services, a way of pushing brands, a genre to attract investment to cutting edge media – and of course, as always, a way of calling public attention to important public issues. This article draws upon research and writing for an article on the SXSW festival in Documentary magazine. Patricia Aufderheide is University Professor in the School of Communication at American University and the founder of the Center for Media & Social Impact there. She is the author of, among other books, “Documentary Film: A Very Short Introduction.” (Oxford).